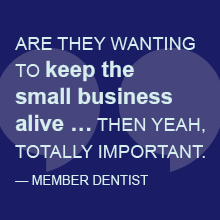 ADA Practice Transitions is a new service offered through ADA Business Innovations Group to foster relationships between dentists at key points in their careers. 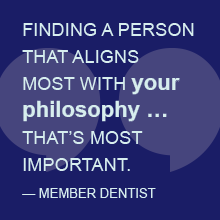 The purpose is to match dentists who are looking to join a practice with owners who are seeking a partner, associate or someone to purchase their practice. ADA Practice Transitions was developed after field research uncovered a need in the marketplace for dentists who want to connect for both employment opportunities and to facilitate the transition of a practice from one owner to another but have had difficulty doing so. Research also found additional needs around learning skills related to basic business management, ownership, patient acquisition, purchasing and staff relationships. Dentists from Wisconsin and Maine will be the first to test an online platform in the first quarter of 2019. Using an algorithm, the online service will match dentists with practice owners by considering aspects such as philosophy of care, personality traits, location and desired practice characteristics. The online platform will also offer tips, tools and training relevant to each dentist’s situation. What really sets this service apart from others in the market is an advisor who will be assigned to the partnership to help facilitate the process and foster a positive relationship for both parties beyond the transaction. In addition to the online platform, ADA Practice Transitions will also oversee the ADA Board-approved pilot initiative to test the feasibility of purchasing up to two dental practices with an intention to sell the practices to dentists who express interest after a target period of time. This pilot initiative was developed after research found a surprising number of practices that are closing down simply because the owner dentist could not find a buyer for the practice. Many of these practices are located in rural areas. For more information on ADA Practice Transitions, visit ADA.org/PracticeTransitions. Yes, I fit the bill. I have a successful practice in a more rural area, we do our best every day to do the best dentistry we can for an appropriate price for our community. 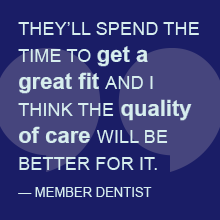 We accept most dental plans, and have been pleased with the new patients that have come into the practice, seeking the best use of their dental insurance. It appears to me that many dental practices are business orientated and less orientated to the actual profession of dentistry. I understand the debt of dental school, and seeking a lucrative situation to help with debt, but some have taken it too far. I see implants done for one missing tooth, with other areas of the mouth with severe needs. Yes I would like to make a transition, but rural area are not a first choice.Hopefully this program will make a difference.